3D printing can make an action figure copy of your body and face, but the hair usually ends up looking like a Lego minifig wig. 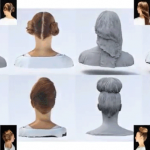 The mad scientists at Disney Research just solved that, with an algorithm so powerful it can trace your hair’s shape and color with ultra-realism. Beginning with several color images captured of the subject’s head, the system firstcomputes a coarse geometry for the surface of the hair. Color information from the images is then added, matching the colors to the rough geometry to the extent possible. In the next step, color stylization, the level of detail is reduced enough to enable the representation to be miniaturized and reproduced, while preserving the hairstyle’s defining features. Finally, geometric details are added in a way that is consistent with the color stylization. Posted in Art, Toys. Bookmark the permalink.